A roasted chicken is one of my family and I’s favorite weeknight dinners. 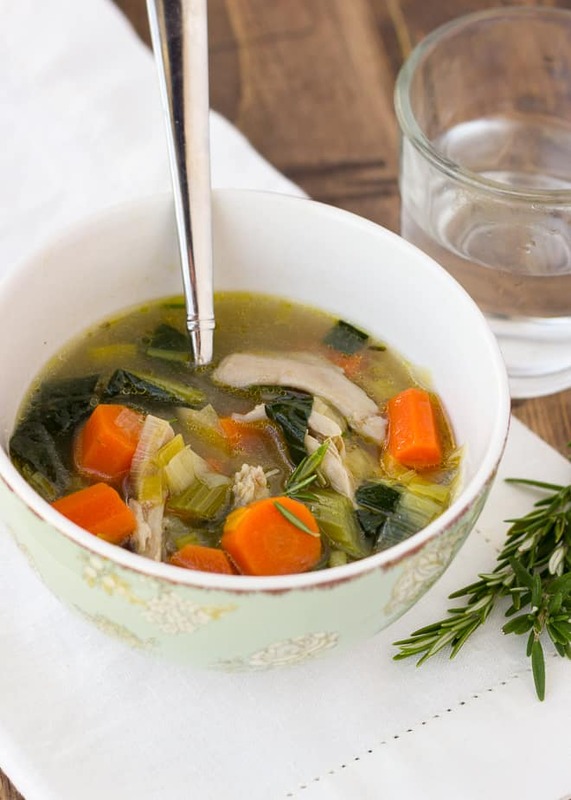 We roast a chicken a few times a month, and every time we do I love saving the carcass/bones to make this delicious healing chicken soup! 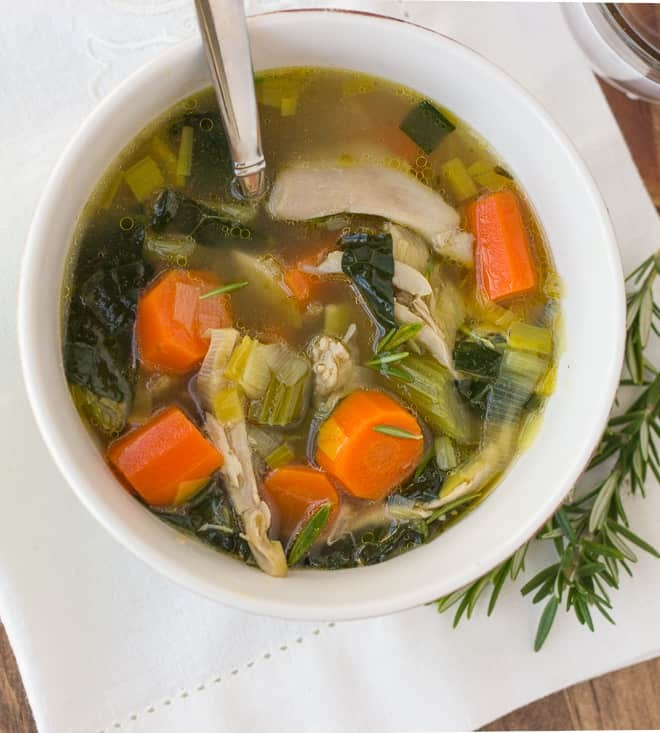 There is a reason chicken soup is what your Grandmother said to eat when you’re sick! Traditional homemade bone stocks are full of many amazing health benefits. Bone broth is very high in amino acids that help your digestive system, strengthen your immune system, and more. You can read about the benefits of homemade bone broth here. Not to mention, homemade stock is so delicious! The flavor of the stock in this recipe is my favorite ever. After simmering the stock for a few hours you strain it. Then you sautee up some leeks, celery, and carrots and add the hot stock. You can throw in leftover roasted chicken or add raw chicken and poach it in the simmering liquid. I always finish soups like this with a big bunch of cut up kale. Leeks, celery, carrots, and kale have many of their own health benefits/healing properties. 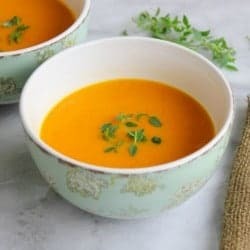 Every time I make this soup, I wish I had twice as much. I could really eat it every day! To make the soup, heat the olive oil in a large pot. Add the leeks, celery, and carrots. Saute until softened, about 5 minutes. Meanwhile, set a fine strainer over a large bowl. Strain the stock by pouring it through the strainer to catch all the solids. You many have to do this in batches. If the stock measures less than 4 cups, add water so the amount equals 4 cups. Add the stock to the vegetables. If you have more than 4 cups of stock, just add it to the vegetables. Add the chicken and bring the mixture to a simmer. Simmer for 20 minutes. 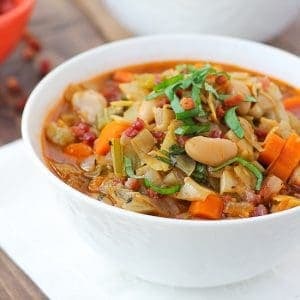 If you are adding raw chicken, after 20 minutes, remove the chicken breasts, shred with a fork, and add back to the soup. Add the kale and cook for another 5 minutes. Add more seasoned salt to taste. Serve and enjoy! *The apple cider vinegar is very important because it helps draw minerals out of the bones to make a rich and nutritious stock. *I LOVE herbamare seasoning. It is made of only dried herbs and sea salt and adds amazing flavor to so many things. It seems a bit pricy, but 1 bottle has lasted me over a year and I use it all the time. This is deliciuosly beautiful. I added some turmeric and lemon juice to the final soup to give it some more health benefits. Was devoured!